Pope Francis blesses the faithful with holy water on Palm Sunday in St. Peter’s Square. Water has powerful religious and spiritual meaning in both Judaism and Christianity. Among Christians of all denominations, the end of Lent and the beginning of the Easter Season involves the blessing of water. We saw an example of this vividly last weekend when, in the Easter Vigil, Catholics throughout the world blessed water and celebrated the sacrament of baptism. It served to remind us that water has great significance and importance in both Judaism and Christianity. Although water can and is seen as something dangerous and wild, that refers mostly to the waters of the sea, which the Hebrews held in some dread. In ancient Mesopotamia, the deity Tiamat, “the Deep,” was seen as an all devouring dragon. Water — fresh water — on the other hand was clearly a source of life. The Second Creation Account (Gen. 2:5-3:24) starts off in a dry and lifeless desert: “as yet there was no grass or shrubbery that has sprung up because God had not caused it to rain...” (Gen 2:5) Creation begins when God causes moisture (Hebrew: ’ēd) to rise from the earth. With moisture — water — life begins. It carries other connotations, as well. In the ancient Near East, water is often connected with the goddess of wisdom. Wisdom brings life and order. The desert is a frightening place, a “howling desert” (Deut 32:10), “a land of horror” (Isa 21:1), filled with strange and dangerous animals. There is neither city nor civilization in the desert. But with water, the wild chaos of the desert gives way to life, order and civilization — the gifts of Wisdom. We see this in scripture; in the book of Proverbs, wisdom is often connected with water (Prov 18:4; 20:5). In the New Testament, something similar can be found in the Gospel of John, which frequently connects Jesus with the Wisdom of the Hebrew Bible. Scholars have long noticed that the Prologue of John’s Gospel (1:1-18) sounds very much like the poem about Wisdom in the Book of Proverbs (8:22-31). Later in the Gospel, Jesus calls those who thirst to come to him and drink (John 7:37-39). Echoing the encounter of Jesus with the Samaritan woman at the well, the water which Jesus offers — his teaching — is spirit and springs up to eternal life. The cleansing properties of water were, of course, not lost on the people of the Bible. Ritual purity was very important for the priests who served in the Temple. Purity was also important for all — priest and non-priest — who would worship at the Temple. There were many things which could render a person impure or unfit to worship in the Temple — everything from touching a dead body to coming into contact with pork. The impure person was purified by washing with water. Even today among some Jews there is the ritual of the miqveh. A miqveh is a pool connected with running (“living”) water that is used for purification. Converts to Judaism — as well as Jewish men and women who have incurred ritual impurity — are required to immerse themselves in the waters of the miqveh in order to become ritually pure once again. The Jewish community at Qumran, who were the copiers of the so-called “Dead Sea Scrolls,” left behind extensive ruins. A very visible part of the ruins are ritual baths or miqveh. So important is the miqveh that Jewish religious authorities hold that new Jewish communities should build a miqveh even before they build a synagogue. Clearly Christianity has taken over a great deal of the symbolism of water found in the Hebrew Bible and incorporated it into our own faith and ritual. We observed this recently, when those symbols played a central role in the observances of Holy Week. The washing of the feet at the Holy Thursday liturgy underlines the cleansing power of water but also stresses that it is a requirement to be with Jesus (John 13:9). The symbols found in the Easter Vigil on Holy Saturday reflect the destructive power of water in recalling the destruction of the Egyptians at the Sea. The waters of baptism are also a symbol of Christ’s death (Rom 6:3). However, the life-giving and cleansing powers of water are also stressed in the waters of baptism which bring newness of life. Throughout the Bible, in both Testaments, the powerful symbolism of water is a common theme. For Christians, the recent observance of Holy Week provided a call to reflect on the powerful role of water in the faith of Christians and Jews — and a bond we share that stretches back through the centuries. A refugee’s life is one of constant uncertainty and confusion. Late 2 April, Israeli Prime Minister Benjamin Netanyahu suspended a U.N. deal that would have sent thousands of asylum seekers in Israel to Western countries rather than to Africa. The deal had been announced hours earlier, but its reversal did not surprise the refugees. 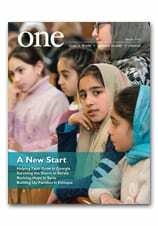 Journalist Don Duncan turns a spotlight on a remarkable prison ministry in Ethiopia in the March edition of ONE. The assignment offered some challenges he didn’t expect, as he reports here. Even before I made the journey to Ethiopia, I’d been warned that this would be a tricky assignment. Through the connections of a CNEWA beneficiary, ONE had the rare and fortunate opportunity to gain access to two of Ethiopia’s prisons so as to see and understand the lives, needs and spirituality of an oft-overlooked population: the incarcerated. I have only ever been in one prison before in my life, a medium-security facility in upstate New York which I visited with a journalism school classmate who was working with me on a crime story. I had no idea what a prison in Ethiopia would be like but I proceeded with a certain sense of caution and even nervousness. I had been warned to be very careful about what kinds of questions I asked. Incarceration is quite politically charged and a hot issue in Ethiopia. A simple question — one that would go unnoticed in a regular context — could wreck havoc in the context of the prison, either among the prisoners or between the prison administration and the Addis Ababa Archdiocese Prison Chaplaincy, the organization that had helped to get us access to the prison. Thus, I entered Addis Alem prison not with the thoughts of which questions I would ask the prisoners but rather which questions I would NOT ask them, under any circumstances. I was to stay away from politics, for sure, but also stay away from any discussion of human rights; any questions that might convey an implied criticism of how the prison is run; and any questions as to the personal histories of the inmates: their homes, family lives, their specific crimes and the length of their sentences. These restrictions, as sensible and well-meaning as they were, made for a very interesting exercise in interviewing. I suddenly realized how spoiled I am in my usual interview practice, in the “outside world,” where the freedom of the press means that no question is off-limits. Now, I had to eventually write a colorful and insightful article based on material I was gathering under very restricted conditions. I was shot through by a low-burning anxiety that the story would be a washout, that it would fall flat on its face because of these restrictions. But to my great surprise, the opposite happened. I’d been briefed that the prison was home to people from places near and far in Ethiopia and that their sentences varied, for crimes of gravity spanning from theft to serial murder. But when I found myself face-to-face with a prisoner, there was no way — because of the restrictions I was working under — that I could know or find out the specifics of his life or crimes. This meant that I could only focus on the here-and-now, his name and age, what his likes and dislikes were, what he was feeling in the present moment and what his spiritual life is like. As I proceeded to interview inmates on these restricted terms, their humanity shone forth. I realized that, had I known their crimes or sentences, my rapport with them or my thinking about them would be shaded by the gravity of their past actions. Without that knowledge, I encountered everyone in the moment and I could fully perceive and appreciate their beauty and humanity as souls. It is a beautiful thought — but it is often, in practice, a tall order. Beyond prison, in the “outside world” that we live in, where there are far fewer restrictions on what we know about each other, how capable are we of perceiving and loving the soul of the sinner in spite of his/her sin? It is rarely very easy to overcome one’s own biases, prejudices and judgments. And yet, Addis Alem prison caused me to be struck again by how truly indispensable a part of living a good life it is to be able to see beyond the sin, in spite of it, to project love. Read Don Duncan’s report, ‘For I Was in Prison’ in the current edition of ONE. For decades, CNEWA’s donors have made a powerful impact on seminarians — helping to educate and train future priests. Most of the Eastern Catholic seminaries where CNEWA serves are supported in varying degrees thanks to the generosity of our donors. For some, our support makes a tremendous difference. It may mean feeding hungry seminarians, or just keeping the doors open. For others, this support means improving the faculty, hiring more teachers or making modest renovations to the facilities. But for all, it represents an investment in the good health and future of the church. Religious women, meanwhile, receive financial assistance from CNEWA from their first days in the novitiate. Although the subsidy may be modest, it represents a commitment of faith and hope — a sign of solidarity with these women as they formally embark on their journey to serve Christ as vowed religious. And then there is the great and growing resource of the laity. The faith formation of the laity is often overlooked, with more attention given to those who are preparing for the priesthood or religious life. But it is vitally important to support the lay faithful, especially in places where it is not always possible to commission a priest or religious. CNEWA continues to place great importance on lay catechetical programs and adult faith enrichment and mission-sending initiatives that challenge the faithful to share their faith with those who have never been exposed to it. Read more in the March 2018 edition of ONE. And hear more from Msgr. Kozar in the video below.